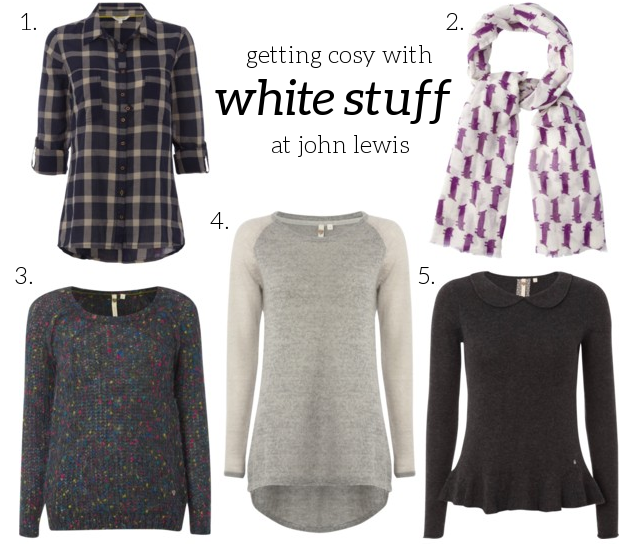 Recently, whilst having a peek on the John Lewis website, I discovered that White Stuff's autumn and winter offerings are perfect for staying cosy as the weather gets colder and the leaves start to fall. I was particularly impressed with their selection of knitwear which includes chunky jumpers, fisherman's stripes and cute pockets. With origins in outdoor sports, the folks at White Stuff certainly know how to keep nice and toasty. I seem to be favouring all shades of grey this season and particularly like their Hatchet jumper. I imagine that it would be ideal for popping over a shirt and teaming with jeans and wellies for an autumn walk. I couldn't resist the collar on their Apple Blossom jumper either. Too cute! Lightweight scarves are a great transition piece to have in your wardrobe. I've fallen for this adorable sausage cat printed scarf! The little cat reminds me of the cats in the Billy Blue Hat books - anyone else remember those? Dog lover's, don't despair! There's a scotty dog scarf too, which is just as cute! What have you been filling your A/W wardrobe with?